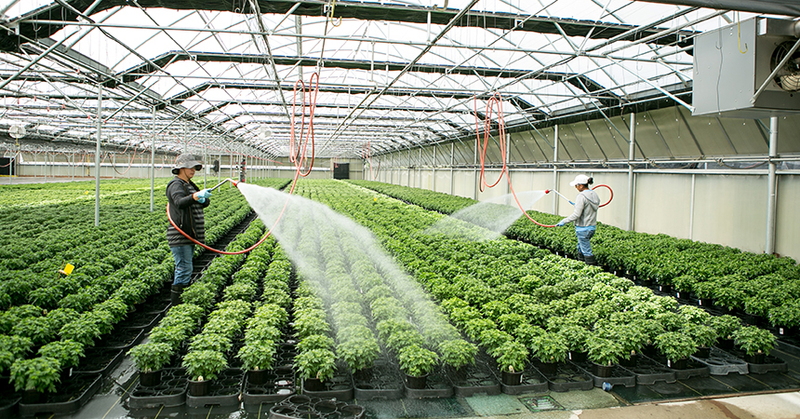 In the nursery industry, greenhouses provide a controlled environment for growing plants. However, in cooler climates greenhouses often require supplemental heating to grow more sensitive plants such as tropical houseplants, or to extend the growing season and increase profitability. There are many opportunities for energy efficiency in greenhouse heating systems, from increasing the insulation value of the greenhouse envelope to increasing the efficiency of the heating system. Energy Trust offers several incentives covering both approaches to energy efficiency. For more details on these incentives and to determine if your facility is eligible, visit www.energytrust.org/greenhouse. Q: What is a hydronic heating system and how does it work? A: Hydronic heating systems heat and deliver hot water to heat the greenhouse to the desired temperature. These systems include a boiler, a hot water piping system and a controller. The boiler heats the water, which is then distributed to the growing areas of the greenhouse through a piping system. A controller with a temperature sensor monitors the process and maintains desired temperatures. Q: What are the benefits of a hydronic heating system? A: The primary benefit is that the grower can target the heat to its most useful location: the root zone of the plants. The hot water distribution system can be placed below the plants, either on or under a bench, or on or in the ground. Applying heat to the plant roots means the grower is not directly heating the foliage or the air above the plants, as a forced-air heating system does. This leads to several other benefits, including less heat stratification (where all the hot air rises to the ceiling) and better plant growth (many plants prefer warm roots and cool leaves). Another benefit is the ability to heat multiple zones in a greenhouse differently, according to crop rotation or varying plant needs. Q: Are there additional ways to be energy-efficient if I have hydronic heating? A: Yes! Upgrading to a condensing boiler rather than a conventional boiler can save some natural gas. A conventional boiler passes heat through a heat exchanger to heat the water and then vents the hot exhaust gases outside the greenhouse. Condensing technology uses a secondary heat exchanger to capture most of the remaining heat energy in the exhaust gases before they are vented outside the greenhouse. This can lead to combustion efficiencies over 90 percent and significant natural gas savings. Further, an intelligent greenhouse controller can lead to energy savings compared to a simple thermostat. An intelligent controller offers the ability to fine-tune the greenhouse heat schedule, allowing a lower nighttime temperature when the plants are dormant. Intelligent controllers can also manage ventilation equipment to the same control temperature, eliminating simultaneous heating and ventilating events and saving labor time. Q: What parts of a hydronic heating system qualify for incentives, and are there any special requirements? Upgrading to a condensing boiler can qualify for Energy Trust’s custom-calculated incentive. This incentive requires pre-approval before anything related to the project is ordered or purchased. Upgrading to under-bench heat distribution piping is eligible for a rebate, whether it is on or under the bench, or on or in the ground. To qualify for this rebate, the under-bench heat must be replacing unit heaters as the primary heat source. Installing an intelligent greenhouse controller is also eligible for a rebate. The primary requirement is that the controller must have a night setback feature. For more details on eligibility and requirements, visit energytrust.org/greenhouse.